While it is certainly true that Democrats cut Obama slack on policies where they would slam Bush or McCain, as a fair-minded Republican I note that the reverse holds true as well: Republicans slam Obama and go easy on Bush. I will establish both points in my areas of expertise, the Middle East and Islam. 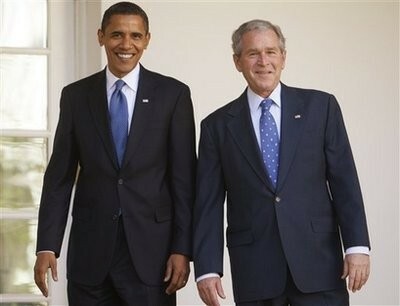 Obama & Bush - sometimes it matters less what the policy is than who implements it. Start with Democratic inconsistency: Although Democrats raged against American forces fighting in Iraq and muttered about their role in Afghanistan, there were more American troops in the combined Iraq-Afghanistan theater under Obama in late 2009 than had ever been the case under Bush – and Democrats were silent about this. Democrats derided Bush for damaging America's reputation among Muslims and Obama placed huge emphasis on establishing a new tone vis-à-vis Muslims. But his efforts had precious little impact, with polls showing Muslims seeing him about the same as Bush; and Democrats are silent. Finally, Democrats bemoaned the clandestine CIA drone program operating in countries where U.S. troops are not based, such as Pakistan. But the Obama administration authorized more targeted killings in its first year than did the Bush administration in its final year. Specifically, there were thirty-six operations in 2008 and fifty in 2009. Republicans, however, also are inconsistent: they mock Obama's insistence on trying diplomacy vis-à-vis Iran, but Bush did the same, authorizing 28 meetings with representatives of Tehran at the ambassadorial level or higher. Republicans excoriate Obama for setting a deadline for the withdrawal of U.S. troops in Afghanistan but said not a peep when Bush did the same for the much larger undertaking in Iraq in the status of forces agreement to withdraw all U.S. troops by the last day of 2011. Conversely, Republicans give Obama little credit for keeping the Iraqi mission basically in place, only speeding up the timetable.